If you thought writing was a prerequisite for being a literary hero, think again. Flaubert famously decreed that the successful author should “live like a bourgeois and think like a demi-god”. The enduring appeal of the Beats lies, to a great extent, in the possibility they seemed to offer of living, as well as thinking, like demi-gods. On those grounds one could argue that Neal Cassady — who embodied the mad-to-live “essence of Beat” — was actually the most important creative force in the group, although he never published a single book during his lifetime. Along with Jacques Vaché and Arthur Cravan, he belongs to an unholy trinity of self-destructive, protean pranksters who burned like fabulous yellow roman candles as they turned their existence into poetry. Vaché (1895-1919) was not simply a dandified anglophile who enjoyed walking the streets dressed as a loose woman or a Napoleonic soldier. His actual military career, serving with the French army in the first world war, was rather less outwardly distinguished. Choosing to be an actor rather than a puppet, he subverted army life by (as he put it) deserting within himself. There, in that Switzerland of the mind, he would pretend that his superiors were under his orders, or that he was fighting for the other side. 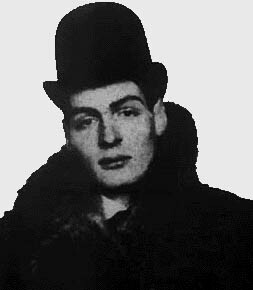 It was gun in hand, sporting an English pilot’s uniform and threatening to shoot at random that Vaché interrupted the premiere of Guillaume Apollinaire‘s Les Mamelles de Tirésias on account of its arty-farty production. A couple of years later, he died of an opium overdose which may have been an accident, but is commonly interpreted as a defiant parting shot to everyone and everything — the ultimate artistic statement. For André Breton — who befriended him during the war and always claimed that he was the originator of Surrealism — Vaché was poetry incarnate. His stroke of genius, he maintained, was “to have produced nothing”. Fabian Lloyd aka Arthur Cravan (1887-1918) put all his genius into his short life; he put only his talent (and a limited one at that) into his works. As David Lalé writes in the recently-published Last Stop Salina Cruz: “His was a life dedicated to wanton destruction, to the extent that he elevated scandal and humiliation into an art form”. Almost too bad to be true, he inspired Gide‘s Lafcadio — the infamous character who kills a man for no other reason but to exercise his free will — and kick-started the Dada insurrection when he crossed paths with Picabia in Spain. After being expelled from an English military academy for spanking a teacher, Lloyd relocated to bohemian Paris where he adopted his pseudonym, partied hard with the likes of Blaise Cendrars and managed to become France’s heavyweight champion without fighting a single match. Never one to shy away from self-promotion, Cravan ruthlessly exploited his reputation as a pugilist poet (although his boxing was on a par with his writing skills) and got a lot of mileage out of being Oscar Wilde‘s nephew. His antics — including giving lectures during which he insulted, mooned and fired gunshots at the audience — led to rough justice at the hands of an angry mob of avant-garde painters as well as a duel challenge courtesy of poor old Apollinaire. Significantly enough, he printed his literary journal on wrapping paper from a butcher’s shop. The onset of the war marked the beginning of a convoluted vanishing act that led him — in various guises — from Paris to Mexico where he disappeared at sea on a drunken boat of his own making. His body was never found. Cravan, the eponymous colossus of Mina Loy‘s novel, had always been larger than life; now, he had taken elusiveness to the point of illusiveness. For decades, he would continue to be spotted in different parts of the world. He is still at large. This entry was posted in Non-fiction and tagged arthur cravan, guardian, jacques vaché, living poetry, neil cassady. Bookmark the permalink.